Sergio Marchionne: "General Motors does remain the ideal partner for us and we represent a not easily replaceable alternative for them." MONZA, Italy (Reuters) -- Fiat Chrysler Automobiles CEO Sergio Marchionne said a tie-up with General Motors was a "high priority" for the company and a merger between the two carmakers was also the best strategic option for its U.S. rival. "That discussion remains a high priority for FCA," he told journalists on the sidelines of the Formula One Italian Grand Prix on Sunday. Marchionne's comments echoed statements made to Automotive News last month that underscored his renewed and more aggressive interest in merging with GM. But Marchionne, who has openly been advocating a merger with GM but was rebuffed, declined to comment on whether FCA would pursue a hostile bid for its bigger competitor. "I have zero comment on that issue. I'm not a good forecaster of the future when it comes to that," he said. Addressing concerns that such a merger could mean job cuts, he said: "The implication of any tie up of that caliber would be absolutely zero on the manufacturing infrastructure of the two companies." In his comments to Automotive News, he said he was not interested in a hostile bid, but added: "There are varying degrees of hugs. I can hug you nicely, I can hug you tightly, I can hug you like a bear, I can really hug you. Everything starts with physical contact. Then it can degrade, but it starts with physical contact." 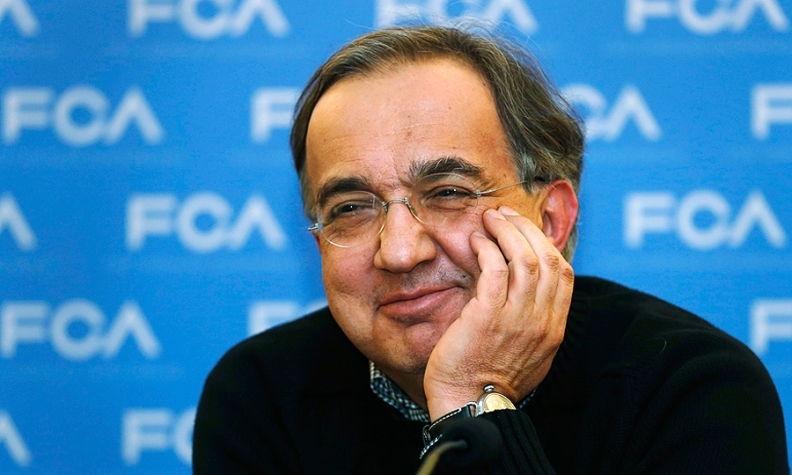 GM, in response to Automotive News, said it was not interested in Marchionne's proposal. One GM insider said, "Why should we bail out FCA?"